Start the Exercise Ball Kick exercise by lying prone over the ball with chest slightly raised, hips over the top of the ball. Move yourself over to one side and engage your transversus abdominus. Only half of your chest and abdomen are on the ball. Extend your outer leg back, but don't let your hips rotate. If you were to place a piece of dowel across your lower back when doing this exercise, it would stay as still as possible. If this is too difficult, try it on the floor first. Add 1-2 kg ankle weights or use elastic bands attached between ankles or between hands and ankles. Gluteal muscles are usually underworked in life and in the gym. This can lead to foot/ankle, knee, hip, and back issues. This is just one way to actively work your gluteal muscles against gravity. By adding an ankle weight or other form of resistance we strengthen core musculature at the same time. 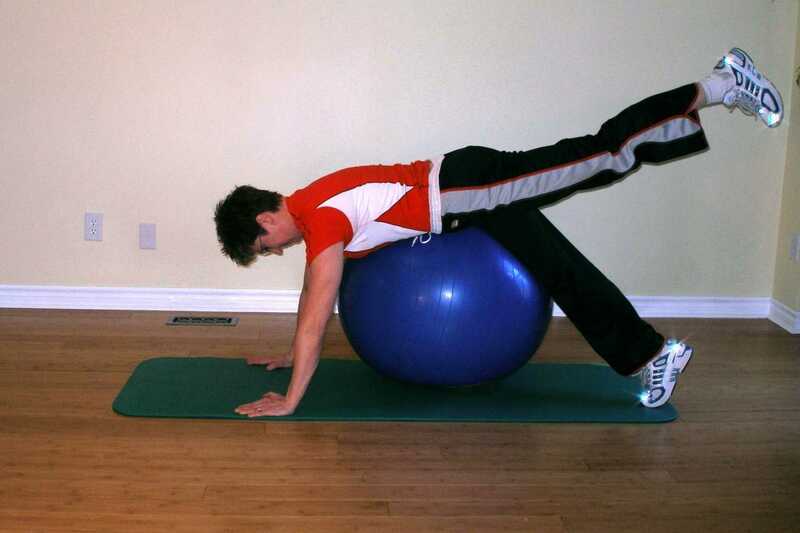 Repeat this ball exercise 20 times on each leg.